Everyone knows that vitamins are important for our overall health. They can keep you healthy while fighting against a variety of everyday illnesses like the common cold and more serious maladies such as certain cancers. Vitamin E oil is one of the best substances you can take for both health and beauty. In terms of the latter, you can rely on it for any number of reasons. LaMav’s product is an excellent choice that is affordable and organic. Here are some of the biggest benefits you can get from it. • Acts as a Moisturizer: Many people suffer from the problem of dry skin. Oil naturally derived from Vitamin E is excellent for correcting that issue. It works well as a moisturizer, bringing your skin to a better condition so that it can be more supple and overall more youthful in the long run. It is a bit heavier than water-soluble products, which means it works best when you apply it directly to your dry skin. • Reverses Premature Skin Aging: Just as the substance can moisturize your skin, it also works to reverse the effects of aging. The oil can prevent wrinkles, sagging and dullness of the skin because it boosts the production of collagen, a substance found naturally in the body that helps the skin maintain its elasticity. It fights against the problem of fine lines and helps you to enjoy a younger appearance. • Treats Sunburns: Unfortunately, it’s easy to become sunburned when you spend time outdoors in the sun in the summer. Oil from Vitamin E can work wonders in speeding up your recovery from a sunburn. Simply apply a few drops of oil directly on the skin and gently rub it over the areas that are burned. You will find relief in a short time afterward thanks to the antioxidants in the substance that help to neutralize the effects of free radicals caused by the sun’s harmful UV rays. • Brightens Up Dark Spots: Dark spots are a big problem for many people, especially as they age. Vitamin E can combat the problem. Mix its oil with a body lotion or another oil like olive oil and apply it directly over all dark spots. After repeating this once per day for a while, you will begin to notice the spot growing lighter and lighter. • Acts as a Cleaning Agent: Oil from Vitamin E can also clean your skin far better than many over-the-counter beauty cleaning products. It eliminates dirt, including that found deep in your pores, and allows your skin to maintain its natural oil balance at the same time. • Treats Stretch Marks: Vitamin E can help to treat and eventually fade stretch marks. Simply rub the oil directly onto the stretch marks in a gentle manner. Over time, you will notice they are fading. This is due to the oil’s ability to promote the skin’s elasticity. • Stimulates Hair Growth: The oil can repair damage hair follicles, promoting healthy hair growth. Apply oil to your scalp, leave on for 30 minutes and rinse with warm water. • Prevents Premature Graying: Oil from Vitamin E can slow development of premature graying of the hair because its antioxidants prevent the degradation of tissue. • Makes Hair More Lustrous: Your hair can be healthier, fuller, shinier and lusher when you use the oil while shampooing. • Repairs Split Ends: Vitamin E can repair split ends in the hair, making it healthier and more beautiful overall. 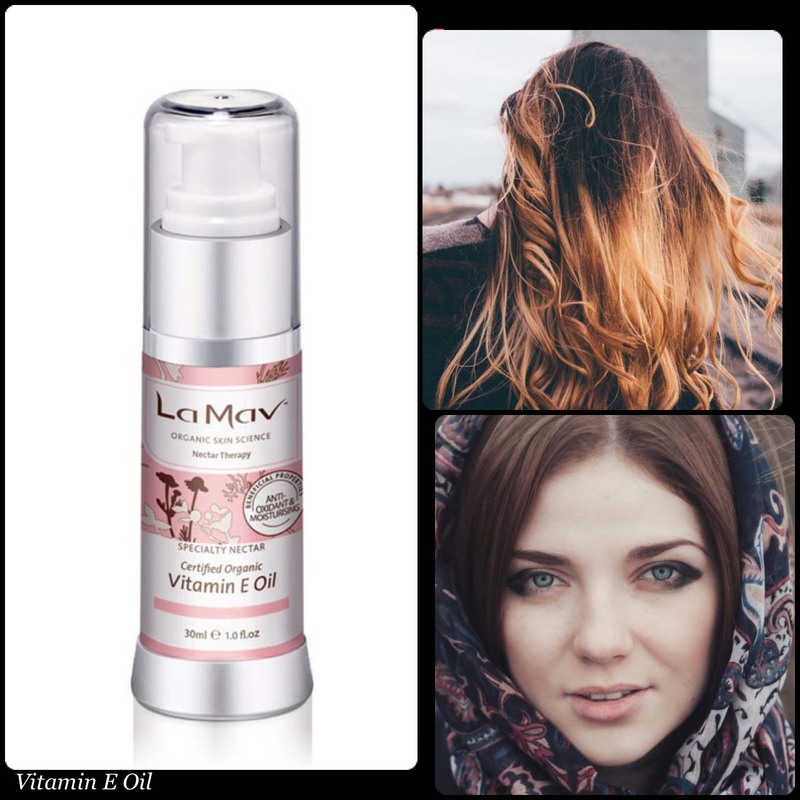 These are some of the main benefits of oil that come from Vitamin E. LaMav’s product is certified organic and inexpensive. You will be delighted with it when it delivers these great beauty benefits.